Summary: A garden cart or wheelbarrow is a workhorse garden tool which many gardeners, DIY landscapers and homeowners “love” as a back and time saver for their work outdoors. Take the time to choose wisely and select the one best suited for your needs. Answer: Allyson, I wish it was possible to give to the “right” answer, but a garden cart or wheelbarrow needs to meet the job and tasks of the user. In fact, I would take the hubby down to the garden center and have him pick his toy out. There has been quite a bit of innovation in the world of gardening tools, including wheelbarrows and carts. So let’s look at some buying guidelines to consider. In selecting the “perfect” wheelbarrow or cart for use around the house, be honest an ask generally… What will be hauled, how will it be used, and who will being using it? This will help in narrowing down the overall design, material construction, price, and size. For example, will this hauling tool be used primarily to move leaves in the fall or a move heavy loads like landscape rocks? Will muscle be needed to operate or will it be pulled behind a lawnmower or ATV? Is a bucket with wheels required or is dumping a requirement? Some of these “carts” may be very simple canvas fold ups for moving raked leaves from one place to another or a hi-tech motorized gas powered wheelbarrow for handling heavy loads. When you consider the operation of a garden cart or wheelbarrow several factors needs to be considered. If heavy materials like large landscape rocks weighing hundreds of pounds are going to be moved, a sturdy metal 4-wheel garden cart makes a lot of sense, but if the maneuvering into tight spaces is also a factor a heavy duty wheelbarrow make be the ticket. If the load is more along the lines of moving the compost pile, spreading mulch, moving leaves or trucking smaller sized rock around your property is more the hauling job description, than a fiberglass, tough plastic wheelbarrow or 2 wheeled cart may be the ideal selection. If your needs are light duty such as moving leaves for leaf mulching and small branches where an industrial strength cart or wheelbarrow is too much, opt for a 2 wheel design made of one of the durable molded plastics on the market. Also consider weight if transport is a issue or you have a need to lift over hole, step or uneven terrain. 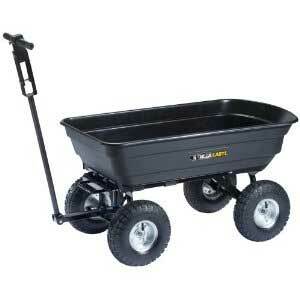 Will a wheelbarrow with 1 wheel or 2 wheels better meet your needs over a 2 or 4 wheel wheelbarrow or cart? Cost is always an issue, especially in today’s cost conscience world. You should weight and compare the value of the cart or wheelbarrow against the cost. How is it made? When it is loaded… will it handle the job? Is it overkill? Paying top dollar does not always deliver the best product needs wise. 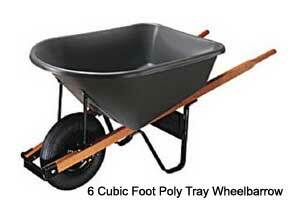 For many homeowners a traditional molded plastic wheelbarrow or garden cart sells for about $60 to $175. Heavy duty and motorized models move up in price from from there. Unless you own a fold-able or light weight model which can hang, you must also consider the space these garden tools take up. They are bulky, but they are a back and time saver. Consider where the cart or wheel barrow will be stored. The weather elements could influence the type of material it must be constructed from. The little extras are features which set one product apart from another. Big Wheels – Large wheels make operation much easier in navigating, hauling and overall ease of use. Some of the 2 wheel carts which you pull by hand have nice size “buckets” but small wheels making operation and maneuvering more difficult. Maintenance – The less parts the better… bolts need tightening over time. Metal rusts where molded plastic or poly formed trays do not. Wood handles can rot over time – Are replacement parts available? Easy Access – Some carts are designed with a drop-down front gate making it easier to fill and unload. This can be a big help when loading mulch, raking leaves or spreading compost. The above items should help you in your buying wheelbarrow or cart buying decision, but let me leave you with my “buying” preference. My preference has always been a 1 wheel model which holds 6 cubic feet, constructed of a durable molded poly bucket for most of the jobs I have need for. The poly bucket or tray does not rust, is easy to clean and durable. It handles and hauls a wide range materials. The large pneumatic tire rolls smoothly, remains steady when filling and dumps easily. On top of all that, they make a nice seat to take a break when needed.